Sunland Park Racetrack and Casino will shift post time to 12:50 p.m. starting on Friday, February 8. SUNLAND PARK, NM—JANUARY 26, 2019—Sunland Park Racetrack and Casino will shift post time to 12:50 p.m. starting on Friday, February 8. Nine races are planned each day. The $100,000 Mine That Bird Derby is quickly approaching. The last local prep for the $800,000 Sunland Derby (Gr. III) is slated for Sunday, Feb. 24 at one mile and one-sixteenth. Nitrous put on an impressive display coming from last to first to win the $106,000 Riley Allison Derby last month. The last local prep for the $200,000 Sunland Park Oaks, the $75,000 Island Fashion Stakes, is also scheduled for Sunday, Feb. 24. Older horses run one and one-sixteenth miles in the Curribot Handicap on that same day. The $800,000 Sunland Derby (Gr. 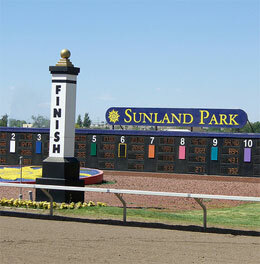 III) and $200,000 Sunland Park Oaks will be run on Sunday, March 24. Live racing resumes on Friday at 12:50 p.m.